The truth is, I don't like pie. I believe there are cake people, ice cream people, and pie people, and the folks who meet in their intersections, especially when accompanied by the words "a la mode." I know lots of people who like two of the treats particularly, especially when served together, but honestly, I don't know nearly as many who like them all, equally. 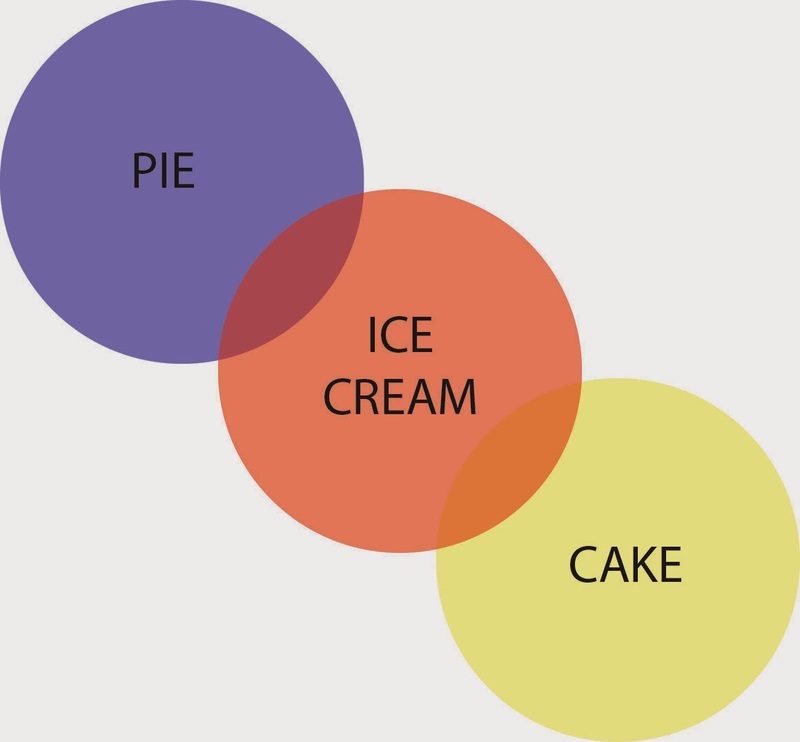 I'm guessing the small section in the center of this Venn diagram hosts sugar addicts and really agreeable uncles, you know the kind, the ones who ask you to make up a plate for them at Thanksgiving, and really don't care what you jumble up on it, they'll just eat it gratefully and thank you for it. God Bless those uncles. 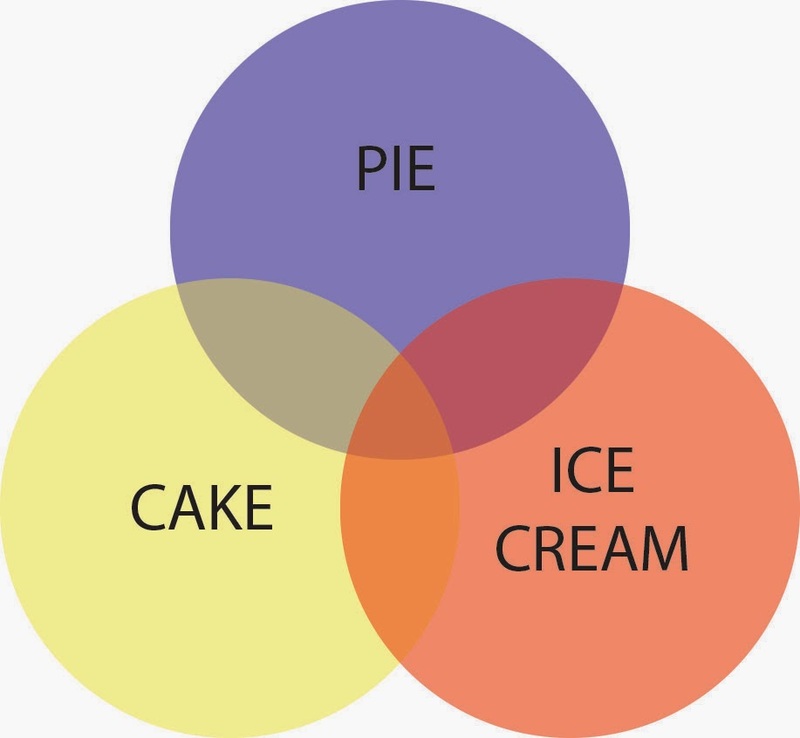 Yep, cake and pie, in their corners, with only ice cream to serve as their liaison. That rings more true. As a cake + ice cream person, pie is not even on my radar. One of my brothers is a pie person—he used to swap out birthday cake for an apple pie every year. I thought that was the saddest thing in the world as a kid; didn't he know what he was asking for was so much less fabulous than cake? As we've grown older, I've learned our dessert preferences probably were a good indication of how we'd see things differently on many fundamental points. Thank goodness for ice cream, which brings us together in family harmony. This weekend, though, my personal feelings about pie don't matter, as the South Side Pie Challenge is all about raising money for local hunger programs. I'm a sucker for this cause: each year, Mike and I host a New Year's Eve sushi party where we invite our guests to bring items to restock one of our local food pantries following the holidays, just as our Chicago winter is turning from cold and unpleasant to bracingly frigid. Even though Christmas is the pinnacle of the holiday season, dropping food off following our NYE party is always one of the most sacred moments of the season for us. Depending on my plans to have surgery this year, we may take a hiatus from our annual party. It feels like a good year to have a break. Several of our close friends and neighbors have moved to different parts of the country, and the party will be decidedly different without them here. Quite frankly, after keeping my house clean for real estate showings from April through October, the added incentive of getting a clean house because I'm having guests over for a party doesn't seem nearly as appealing as in past years. Been there, done that. The only thing that makes me feel truly sad about a cancellation is thinking about that food pantry, and how great the need is for it to be stocked. So...pie. I can make a pie. I like to figure things out in the kitchen. Have I made this pie before? Heck no. Do I have a recipe? Only the one in my head. Will it taste good? Who knows! The only way for any of us to know is to show up and taste it, along with many other (likely much more delicious) entries. Eat pie, and do good, too? YES, PLEASE.